Night and day in the same setting gives this tribute painting to Rene Magritte a surrealistic feel. At first glance, my most recent painting doesn’t appear to be surrealistic at all. Yet anyone who is at all familiar with the works of the Belgian surrealist, Rene Magritte would immediately recognize traces of his work. The statue in the painting is a depiction of the character that shows up in many of Magritte’s paintings. The bowler hat theme appears more than 50 times in his work between 1926 and 1966, making it one of the motifs for which the Belgian Surrealist is best known. These abundant bowler-hatted gents were used as stand-ins for generic, bourgeois men, the sort who wouldn’t stand out. I have explored many of Magritte’s concepts and ideas in my own, peculiar style. I recently ran across a framer who worked in the art gallery where I had my first show and he said he walked into 1900 Park two years ago and immediately recognized my work. “Your style is unlike any other painter I’ve seen,” he told me. Whether that’s true is highly debatable. I continue to try and paint the impossible – or at least the highly improbable. 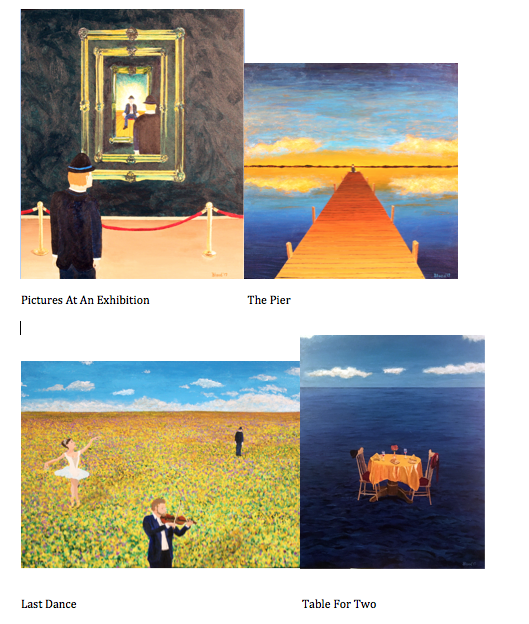 And traces of Magritte will continue to show up in my paintings. 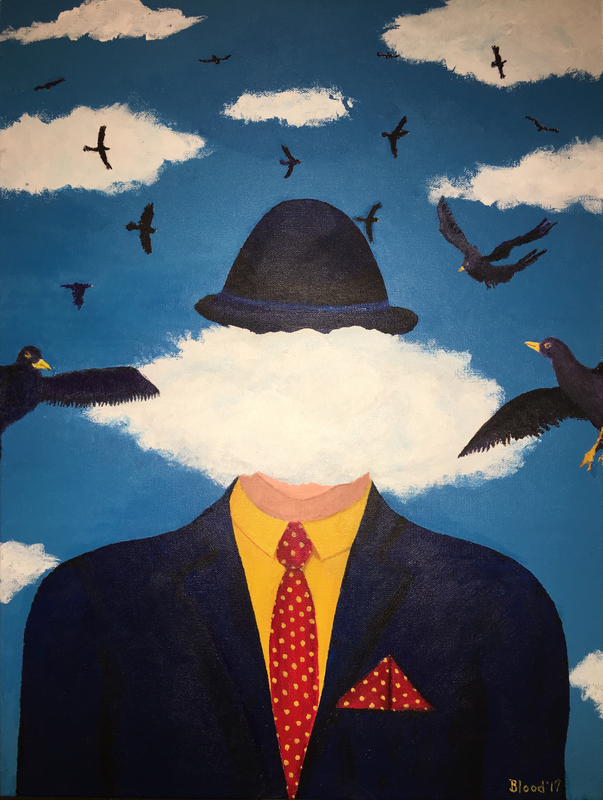 When I heard that I was going to be featured in the Ladue News and that the featured painting would be “Memories of June” – another Magritte-based image, perhaps my subconscious propelled me to create this tribute painting to my favorite artist. 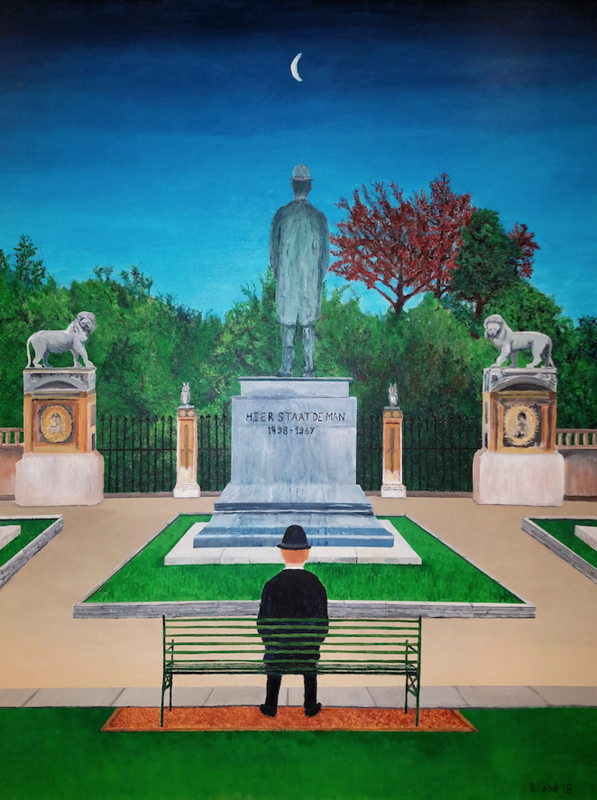 Maybe there is a touch of surrealism in depicting a man in a bowler hat, sitting on a bench, staring at a statue of a man in a bowler hat. The base of the statue features Magritte’s birth and death dates and the inscription is in Dutch and reads, “HERE STANDS THE MAN”. Lions and owls showed up in many of Magritte’s paintings. So they got their own statues. Perhaps the one quality that puts this particular painting in the Surrealist column is the presence of Night and Day in the same setting. Everything below the sky is painted in bright, daytime colors. Yet the sky, with its quarter moon above, is distinctly night time. That combination of Night and Day was another concept Magritte explored in several paintings. So in answer to the question found in the headline, yes, this really is surrealism. It was great fun to create, though quite tedious as it’s one of the more detailed paintings I’ve done. This particular painting may never find a home other than my own. That’s okay. It was my tribute to Magritte. It is fitting that I should remain the owner. Tom’s art can be viewed and purchased at two different websites: www.bloodlinesart.com and http://tom-blood.pixels.com – on the latter website, you can purchase prints as well as a variety of items like tote bags, pillow throws, iPhone covers and much more. Please visit! Head In The Cloud – My first painting done in 2017. With 2017 coming to a close, I decided to look back on all of the surrealistic paintings I’ve done this past year. Initially, I thought I was on my 12th painting, hoping to finish it before the year ends. Actually, I’m only on my 10th and I’m about 70% done as of December 11th. My how time flies. Still, 2017 has shown promise in terms of my overall skill development. I am continuing to improve as a painter and though I still follow the surrealist path of Rene Magritte, I’m also developing my own, unique style. Was there a common theme? No. I like to paint ideas and they come in a variety of imagery. The photograph doesn’t do this painting justice. The bridgework is very detailed. It was a strange idea that literally came to me in the middle of the night with almost this exact image in mind. I’m not afraid to borrow. I have used other paintings as inspiration. I often use source material to get my own drawings as close to reality as my skill level permits. 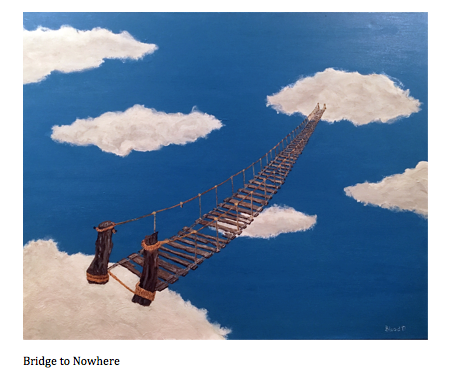 When I created “Bridge to Nowhere” I found a schematic of a footbridge. I don’t pretend to draw these items from memory. But I do draw them all freehand and then begin the process of turning it into a painting. 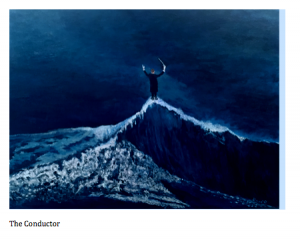 In the concept stage, I envisioned a conductor in charge of the elements similar to Fantasia. Some of my ideas are borrowed adaptations. Others, I have no idea where they come from. With “Lightness of Being” I was exploring Magritte’s concept of a giant floating rock. For some reason, I thought of a little girl holding a hot air balloon – only instead, it would be a floating rock. I loved that image and that’s what I drew on the canvas. 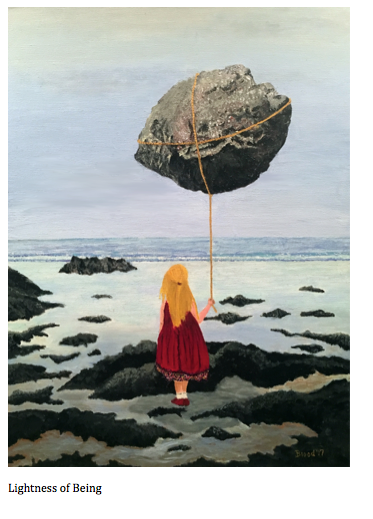 At first, she was going to be standing in a field of flowers but once I had drawn the balloon/rock, I decided to shift the scene to a rocky beach. It’s probably one of my favorite images I’ve done so far! A girl stands gazing out at the ocean, holding a giant, floating boulder that some people think is an asteroid. What to paint next is always the mystery upon completion of whatever I’m working on at the time. Similar to reading a book, I never conceptualize a new painting until I’m done with the one that’s right in front of me. 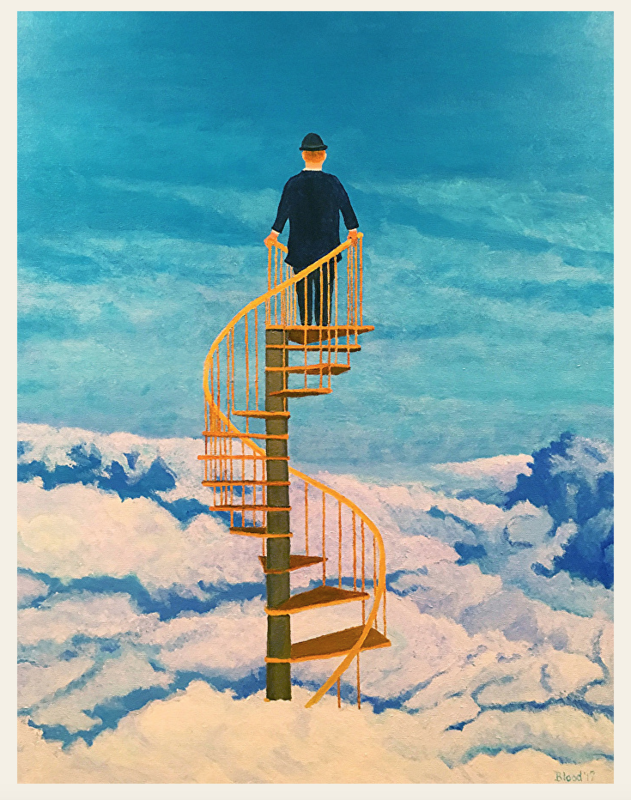 While searching for inspiration for my next subject, I ran across two items that I combined into one – a spiral staircase and a view of clouds shot from above, rather than below. And thus was born, “View from Above”. A man stands atop a spiral staircase that has given him a view from above the clouds. I’ve been very happy with both the concepts and the execution of my last three paintings. Yet most of my work seems to go unnoticed – especially when it comes to sales. If I relied on the income generated from my paintings, I would truly be a starving artist. I remember after my second gallery show back in 1991, I created a painting called “Nobody Noticed”. It featured two people walking off either side of the painting, oblivious to a roped off gallery that featured a framed painting of the night floating against a cloudy blue sky. That painting has received more views on my pixels website than any other painting I’ve done. Perhaps that frustration that since I’ve resumed painting about 3-1/2 years ago, creating more than 30 new canvasses resulting in a grand total of two sold paintings led me to my most recent effort which is still a work in progress. Modern Art – still in progress. The other art work needs to be added along with two picture frames, a baseboard and then lots of shadowing. Overall, 2017 has been a year of interesting concepts combined with better painting techniques. I had my first solo show in more than twenty years in 2017 at 1900 Park. I exhibited at Soulard Art Gallery twice and received an Honorable mention for “Head in the Clouds”. I also was part of MySLART’s monthly 33 show in the summer and I’ll have my three most recent completed works on display December 29th at the Old Orchard Gallery. Add in a few greeting cards via Greeting Card Universe and there’s certainly been a lot of activity. I am determined to keep on keeping on and look forward to what’s next knowing that someday, the sales will come. So onward we go. I’ve got a painting to finish. 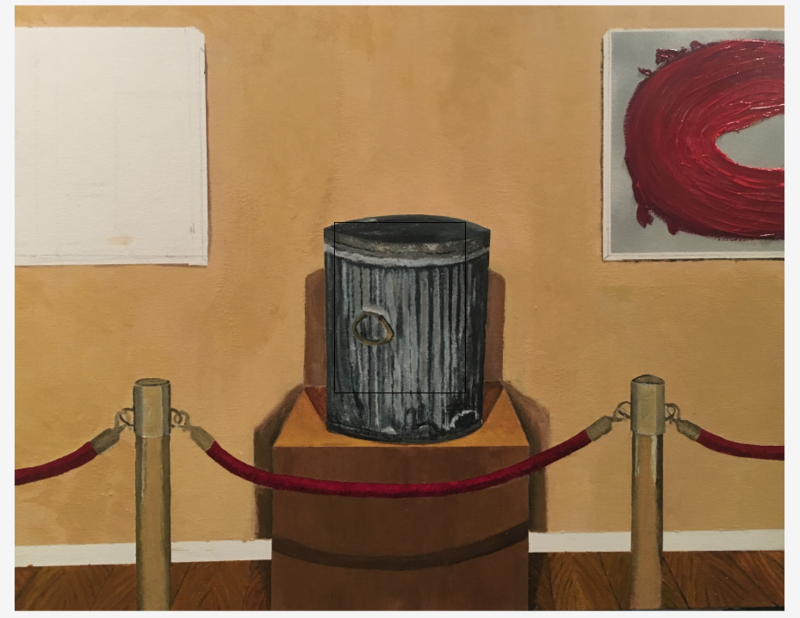 In addition to providing advertising and marketing communications services by day via BloodLines Creative, Tom is dedicated to becoming a better surrealist painter, trying to paint the impossible. He invites you to visit his work at his Pixels website, or via his BloodLines Art website. His work can also be viewed on Pinterest, Saatchi Art and on the mobile app, Art Loupe.